Monday, April 9th at 8:30 p.m.
Friday, April 13th at 7:30 p.m.
Monday, April 16th at 8:30 p.m.
Friday, April 20th at 7:30 p.m. Thanks to John Cuneo of Punch Films for helping to make this possible. 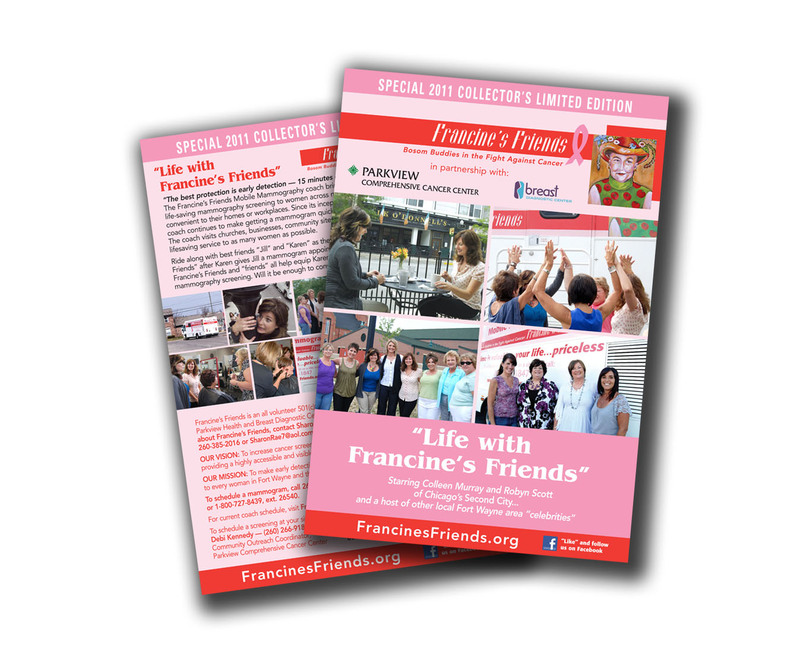 "Life with Francine's Friends" premiered at last year's annual October fundraising event. The video/23-minute short film asked luncheon attendees to ride along with best friends “Jill” and “Karen” as they learned more about “life with Francine’s Friends” after Karen gives Jill a mammogram appointment on the coach for her birthday. Francine’s Friends and “friends” all help equip Karen with ammunition about early detection and mammography screening in an attempt to help convince Jill to "get on the coach." Robyn Scott and Colleen Murray, of Chicago's Second City star in "Life with Francine's Friends" and are also real-life best friends. Robyn and Colleen also graciously agreed to host, emcee and introduce the video premiere to the luncheon audience. Along with Scott and Murray, "Life with Francine's Friends" features Francine’s Friends founders, partners, board members, funders, sponsors, table captains, community supporters, breast cancer survivors and a host of other “friends” and was filmed locally at Toscani's Pizzeria, Fort Wayne Urban League, Scotts Foods and TrendSetters Hair Design. The video was created locally by PUNCH FILMS, in association with Francine’s Friends, Inc. and Emley Design Group, and was produced by PUNCH's John Cuneo and Derek Devine. The Comcast airings hope to raise awareness and continue to inspire women (and men) to take action and support mobile mammography and the importance of early detection.